…LA FOI… shopping therapy bags by Italian designer Federica Ameri should be considered as pieces of modern art. These bags are a real embodiment of our beloved quote "Shopping is the best medicine". There is actually the reason why. Designer Federica Ameri was born in the family of doctors, her parents obviously wanted her to be in the track of them, but she has always been enthusiastic about design. Federica graduated from Art, Fashion and Design Academy in Florence and started to work with different projects like Vanity Chair in the field of contemporary art. Capsule Collection was born in 2015 as a line of sophisticated and eccentric mini bags that pay homage to the designer's family. 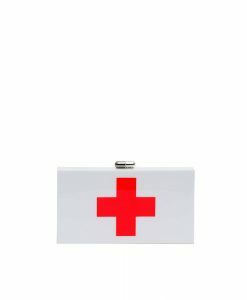 We love the creativity and uniqueness of LA FOI clutches. For sure, they will complete your collection of one of a kind fashion bags.